Kristyn Leach likes the tools at Koreana Plaza. Home and garden stores can be costly Edens, with every $70 watering can and $1,000 chicken coop a temptation. "It's like a vortex of impulse buys," said farmer and Oakland resident Kristyn Leach, of Namu Farm. Such stores can make urban agriculture look like a gentleman's hobby, for trust-fund kids with pastoral dreams. But raising your own food doesn't have to be a bourgeois venture. Seek ways to offset water costs. Some cities distribute rain barrels for free, which can help residents deal with the rising cost of water. 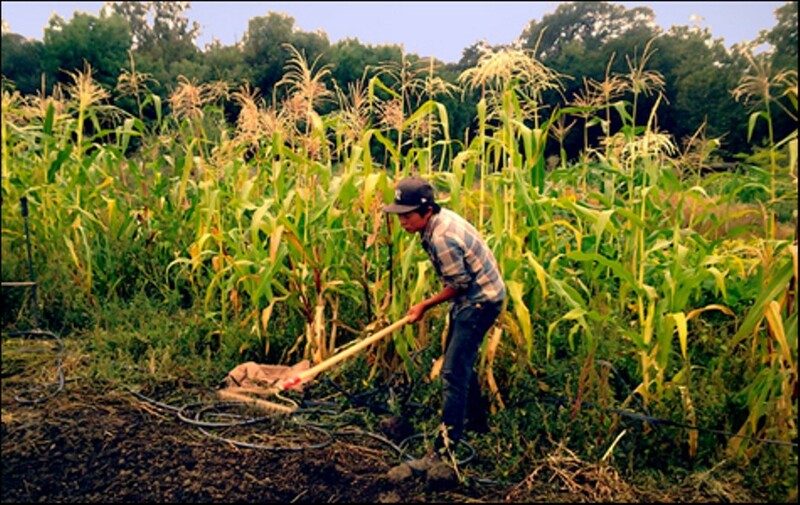 Another popular permaculture method is redirecting greywater from washing machines (with only eco-friendly cleaners used) into a drip irrigation system. Phat Beets Produce organizer Max Cadji, who has worked on more than twenty gardens and farm projects across the Bay Area, mentioned one New Orleans farm's solution: Dig a well, and pay county water rates instead. Mulching also decreases the need for water — Craigslist often advertises free mulch deliveries by tree trimming companies. Invest in tools. "One important upfront cost is tools," said Leach. "If you use the wrong tool, the work can end up taking too much time, or you can strain your body in some way." Leach likes Ames brand tools, and the tools found at Koreana Plaza (2370 Telegraph Ave., Oakland). "They're kinda janky and weird, but they have a lot of good character." In addition, local tool-lending libraries are a good resource for those planning to use a particular tool once or twice. Berkeley's newly remodeled Tool Lending Library (1901 Russell St., Berkeley) is set to reopen on May 11. Start early to remove lead from soil. Lead-heavy soil is common in the East Bay's low-income areas, necessitating the addition of clean dirt. "You can also plant sunflowers or mustards to bind the lead and remove it from the soil," said Cadji, "but then you have to harvest and burn them to remove the lead. You can't compost them. It takes a couple of years to do. You can also immobilize lead by mixing ground-up fish bone into the soil." Avoid glossy packaging and buy in bulk. "Gardeners will spend $2.50 to $3 for a packet of organic seeds, and all you're really paying for is the packaging," said Cadji. "There's only a few seeds in them. The mistake is in not sharing seeds with other people, and not ordering together. You'll save a lot of money that way." The same goes for animal feed and fertilizers — get a large group of people together and buy big. Use compost as a basic soil amendment. 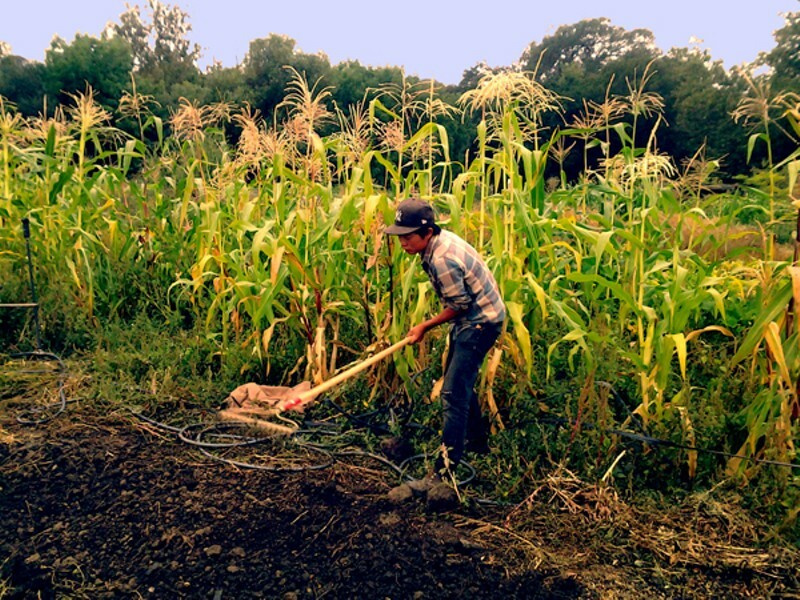 "Good, well-digested compost is the best long-distance runner you can get," said Leach. Cadji added that East Bay backyards often don't need other fertilizers, like fish emulsion or kelp, if you use compost. "Most yards have never been farmed before. There usually isn't a problem with soil fertility." You can either make compost yourself or buy it. Scavenge and hoard. The sidewalk is a treasure trove. Chunks of concrete can border garden beds, wooden pallets can side compost bins, and old blinds can label plants. Local chicken enthusiast Liz Garfinkle built her coop for almost nothing. "I had scrap wood from various projects, and I found the door on the street." The Essential Urban Farmer, by Novella Carpenter and Willow Rosenthal, provides plenty of inspiration. Feed your animals on scraps and food excesses. "There's so much waste that chickens can eat," said Cadji. "You can get okara [a waste product of making tofu or soymilk] from local soymilk makers, stale bread from Acme Bread and Vital Vittles, leftover mash from breweries. Or [you can] go to the food bank and pick up their waste. A lot of farm animals can eat scraps and weeds from the garden, too." Save your seeds. "There's a mystique around saving seeds, but it's one of the most natural things to do," said Cadji. "If you grow greens [from the brassica family], there may be genetic variation, but you'll still have some sort of collard, kale, or chard." Other plants, such as fig trees and some mulberry, can easily be rooted from cuttings. Give and get back. Eggs and crop excesses are a powerful bartering tool. It's not uncommon to strike deals or discounts with repair people, restaurant chefs, and others when homegrown food is brought into the bargain. Offer your lemon cucumbers to a restaurant that uses local produce, and see what happens.